It’s been nine months since fans have seen WBC Jr. Featherweight champion Rey Vargas (32-0, 22 KOs) in the ring. Tomorrow night he returns against Franklin Manzanilla (18-4, 17 KOs). 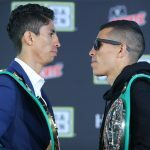 The post Rey Vargas vs. Franklin Manzanilla: Fight Preview appeared first on Round By Round Boxing.